Contrary to the situation in early breast cancer, little is known about the prognostic relevance of the hormone receptor (HR) and human epidermal growth factor receptor 2 (HER2) in metastatic breast cancer. 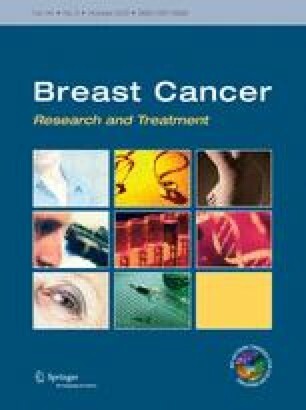 The objectives of this study were to present survival estimates and to determine the prognostic impact of breast cancer subtypes based on HR and HER2 status in a recent cohort of metastatic breast cancer patients, which is representative of current clinical practice. Patients diagnosed with metastatic breast cancer between 2007 and 2009 were included. Information regarding patient and tumor characteristics and treatment was collected. Patients were categorized in four subtypes based on the HR and HER2 status of the primary tumor: HR positive (+)/HER2 negative (−), HR+/HER2+, HR−/HER2+ and triple negative (TN). Survival was estimated using the Kaplan–Meier method. Cox proportional hazards model was used to determine the prognostic impact of breast cancer subtype, adjusted for possible confounders. Median follow-up was 21.8 months for the 815 metastatic breast cancer patients included; 66 % of patients had the HR+/HER2− subtype, 8 % the HR−/HER2+ subtype, 15 % the TN subtype and 11 % the HR+/HER2+ subtype. The longest survival was observed for the HR+/HER2+ subtype (median 34.4 months), compared to 24.8 months for the HR+/HER2− subtype, 19.8 months for the HR−/HER2+ subtype and 8.8 months for the TN subtype (P < 0.0001). In the multivariate analysis, subtype was an independent prognostic factor, as were initial site of metastases and metastatic-free interval. The HR+/HER2+ subtype was associated with the longest survival after diagnosis of distant metastases. This work was supported by the Netherlands Organization for Health Research and Development (Grant Number ZonMw: 80-82500-98-8003).